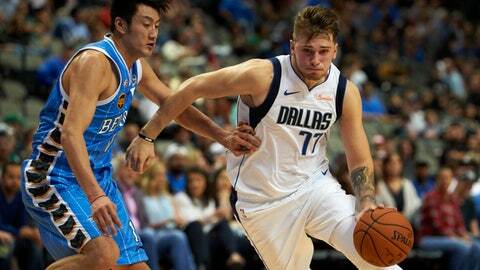 DALLAS (AP) — Luka Doncic is getting help from a variety of angles as the teenager makes the transition from European basketball to the NBA with the Dallas Mavericks. The Slovenian rookie has mom to keep things settled at home, 40-year-old fellow Euro transplant Dirk Nowitzki to teach what it takes to become an NBA MVP and young point guard Dennis Smith Jr. to share the burden of expectations for lifting a fading franchise. Add it all up and there’s still plenty of work the 19-year-old faces on his own as a potential international star in an increasingly global league. Nowitzki emerged from a rough rookie season 20 years ago to become one of the NBA’s seven 30,000-point scorers. The German changed the game as a 7-footer who could shoot 3-pointers and was the centerpiece for a franchise that made 12 straight playoff trips and won the title in 2011. The Mavericks have Doncic because those days are over, replaced by consecutive losing seasons and a pair of top 10 picks. Dallas got Smith at ninth overall last year, then traded up two spots with Atlanta for Doncic, the No. 3 overall pick, four months ago. Nowitzki is about to set a record with his 21st season with the same franchise, now a complementary piece that is likely to come off the bench for the first time since his rookie year. This figures to be Doncic’s only season with the 13-time All-Star, 2007 MVP and 2011 Finals MVP. Doncic left home at 13 to join the professional club Real Madrid. The 6-7 guard-forward capped that six years of experience by winning Euroleague MVP and Final Four MVP honors while helping Real Madrid win a championship just days before he was drafted. That’s where the conversation about Doncic’s readiness begins, and he isn’t ducking the lofty hopes Dallas has for him. While Smith is a pure point guard, Doncic possesses many of those skills. One of the first things Nelson said about Doncic after the draft was that he loves to pass. Coach Rick Carlisle appears set to start him at power forward, but says he can play every position except center. The first thing to watch with the Mavericks trying to return to relevance in the tough Western Conference will be how Smith and Doncic play off each other. Smith attended Doncic’s introductory news conference in June and liked what he saw in the first preseason game. As for the Texas transition, Doncic is coming along fine. He’s already attended two Dallas Cowboys games (“I’m really becoming a fan of that sport,” he said) and already has a favorite steakhouse. Among the early priorities for Doncic, fluent in four languages, was finding a good Spanish restaurant. His favorite player is LeBron James, but the game circled on his calendar isn’t the Lakers. That would be Miami, since countryman Goran Dragic plays for the Heat. Doncic and Dragic have been friends for some time and spent the summer of 2017 together as they helped their country win the European championship and Doncic was regularly picking Dragic’s brain about the NBA. Dragic also got a glimpse of how Doncic will handle the transition. Although significantly shorter than Nowitzki, Doncic is bulkier, which could help with the “rag doll” effect that Nelson described with the way a certain lanky German was manhandled two decades ago. Smith held his own pretty well as a rookie. It’s not lost on the Mavericks what they hope Doncic becomes.